E STREET READS The Santa Rosa main library embraces digital as it celebrates the printed word. Only a few years ago, a visit to the main branch of the Santa Rosa public library on E Street downtown was a visit to no man's land. It wasn't just the homeless who congregated outside, used the bathrooms and sometimes monopolized the newspapers. The homeless were the least of the problem. 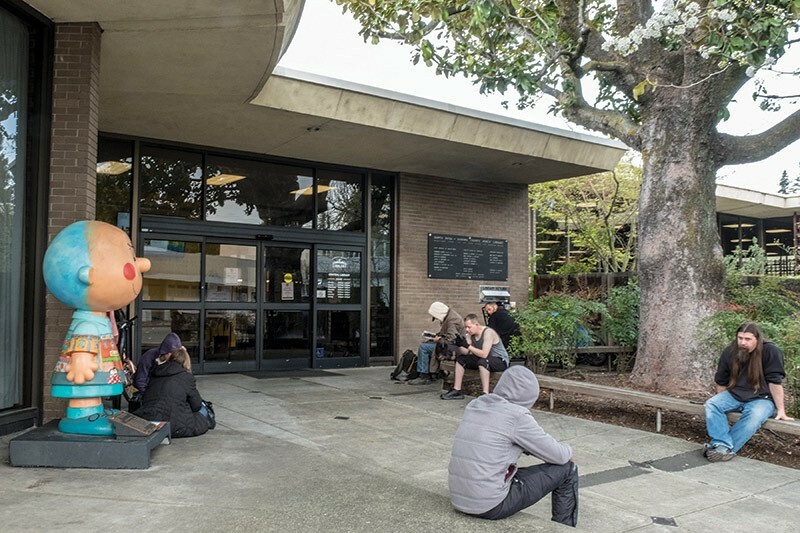 The library was underfunded, resources were dwindling and a kind of malaise hung not only over the Sonoma County library system, but on public libraries from coast to coast. The onrushing digital future meant that print was dead, books were dead, libraries were a relic—and everyone loved their Kindle so much that they didn't notice that their local libraries' hours had been slashed. Well, not so fast. As libraries emerged from the wreckage of the 2008 Great Recession—and with the assistance, locally, of Measure Y—they adapted and reinvented themselves for the digital era. Now the E. Street library feels new, clean and sharp—and is a more vital community resource. Along with its usual functions, for example, Coffey Park fire victims flocked to the library after the catastrophe to help them find records of deeds, maps and property lines that were buried under ash and soot. A big part of the library budget—$30.5 million for the current fiscal year—comes from about $19 million in property taxes, which can vary from year to year; when Sonoma County prospers, its libraries prosper. Measure Y, approved by voters in 2016, pumps an additional $11 million a year into the library budget. Amy Tan, the daughter of Chinese immigrants and the author of The Joy Luck Club, attended grammar school in Santa Rosa and recalls the impact the local library had on her. "I borrowed books from the public library and read all the Little House on the Prairie novels by Laura Ingalls Wilder," Tan says. "I won a prize for an essay titled, 'What the Library Means to Me.' I said that it "Turned on a light in the little room in my mind." Clare O'Brien has been a librarian in Sonoma County for 22 years, and has watched as young readers have grown up in the library. "The public library is often the entrance to the big world beyond the family," she says. "Reading books brings people together and instills a sense of empathy for others." The revived culture of the book is growing in Santa Rosa, Cloverdale, Petaluma, Cotati, Sebastopol, and beyond. Books live. "People are reading a lot," says Sonoma County librarian Nancy Kleban. "They're reading more than ever before." Why? Because books like Shoshana Zuboff's The Age of Surveillance provide the kind of in-depth information unavailable on radio, TV or the internet. Books present unorthodox viewpoints that tend to get buried under the sheer mass of data that saturates markets. A book is a friend in a way that a computer rarely if ever is. The Sonoma library system is 12 branches strong, and most of the libraries have a built-in specialty collection. For researchers, the main branch downtown is just a few paces from a county building that houses the History and Genealogy library. For enologists, there's the Wine Library on Piper Street in Healdsburg. For archivists and genealogists, there's the Petaluma History Room at the Petaluma Fairgrounds. For readers at far-flung Sea Ranch and Stewarts Point, a bookmobile delivers the latest bestsellers, along with the classics. Jack London's literary career began when he wandered into the Oakland Public library and met Ina Coolbrith, who sent him home with an armful of books. London never forgot the librarian who started him on a literary journey that led to the publication of 50 books, many written in Sonoma. His books are in constant circulation at the Sonoma branch (rare editions of his work are kept under lock and key at the History and Genealogy library). According to the county, 223,771 Sonoma County residents have library cards. An additional 23,000 public school students are enrolled in a new, innovative program that provides them with unlimited access to all the technologies that the 21st-century library has to offer. The students don't have a library card and use a school identification number that serves as a passport to the library. They don't pay fines for late books. Last year, Sonoma County library patrons checked out 2,000,000 individual items—CDs, books and DVDs—a stunning figure that's on the ready fingertips of Ray Holley, community relations manager for a library system that now offers digital services, e-books, e-audiobooks, streaming movies, language-learning programs, reference databases, magic shows, storytimes for children, trivia nights, live music for all ages, writing workshops for teens, and workshops for adults to help them maximize their Social Security benefits. And plain ol' books, too: Right now the most popular book with Sonoma County adults is Delia Owens' bestselling debut novel, Where the Crawdads Sing. The library system has 116 copies of the book. As of late last week, 350 people were on the waiting list. Holley has an office at the new library headquarters on State Farm Drive in Rohnert Park. It's a step up from the former headquarters housed in the basement of the central library. The new headquarters is bigger, brighter and well-staffed. Some employees spend the day doing nothing but ordering books. Holley attended Santa Rosa Middle School in the 1960s and says he still has his library card from when he checked out adventure stories from the main branch. "I was a bookworm." The library system also has a new director in Ann Hammond, former librarian for the city of Lexington, Ky. who brings with her library experience in Maryland and California, and at both private and public institutions. She's making $183,000 a year at her new post; beginning library aides earn around $16 an hour, and branch managers make up to $58 an hour. Holley says the 11-member Sonoma County Library Commission is tuned in to the acutely high cost of living in the county "and are committed to a fair, equitable and sustainable contract" as the commission negotiates a new labor agreement for non-executive library employees on the lower rungs. Holley says Hammond's doing a fine job in her new post. "From what I've seen, she's earning every penny of her salary," he says. Hammond's still finding her way, she says. "I'm trying to get a handle on everything. In Lexington I had a simple budget. Sonoma is a challenge, though I know that the library here has amazing programs, great collections, and a staff that wants to do more than it's doing." It's a challenge, she says, because Sonoma County has nine cities and a population of about 500,000. Lexington is a single city with a population of about 322,000. Thanks to Measure Y's passage the Sonoma County library system's in good shape to meet the challenges of literacy in the digital age. They're buying lots of books and DVDs, upgrading computers and buying 500 wifi hot-spots at a cost of $400,000 to help residents without internet access. None of it would have happened without Measure Y, which allocates an eighth-of-a-cent from county sales taxes to fund libraries, and pumped $11.5 million into the library system last year. As part of its mission to democratize information, the library is making it easier for people without access to the internet—because they live in remote geographical areas and can't afford it—to get online. A poster at the Roseland library reminds patrons, many of them Spanish speakers without home computers, that one-fourth of all households in America don't have internet access. In Sonoma County, many of those households are clustered in southwest Santa Rosa and along the Russian River. Kate Keaton, the Roseland branch manager, says that many kids assume they'll have to pay to take a book home when they come to the library. They're elated when they learn that they can leave with a picture book in English or Spanish. Marlene Vera is a native of Peru who works at the Roseland branch. She helps the neighborhood kids learn the letters of the alphabet in English. "There are no real libraries in Peru," she says. "Not like here."